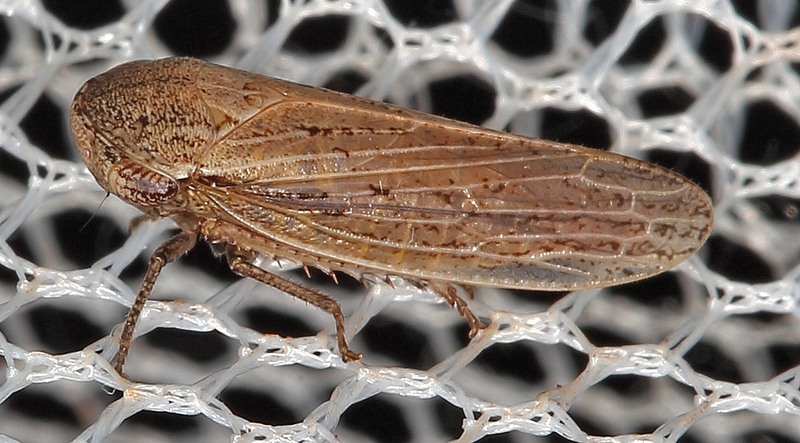 Almost every gardener is familiar with Mole Crickets. They have a very distinctive appearance and are encountered when digging is loose soil or in soil that is wet. They are frequently attracted to lights. Mole crickets are often accorded their own separate family, the Gryllotalpidae. 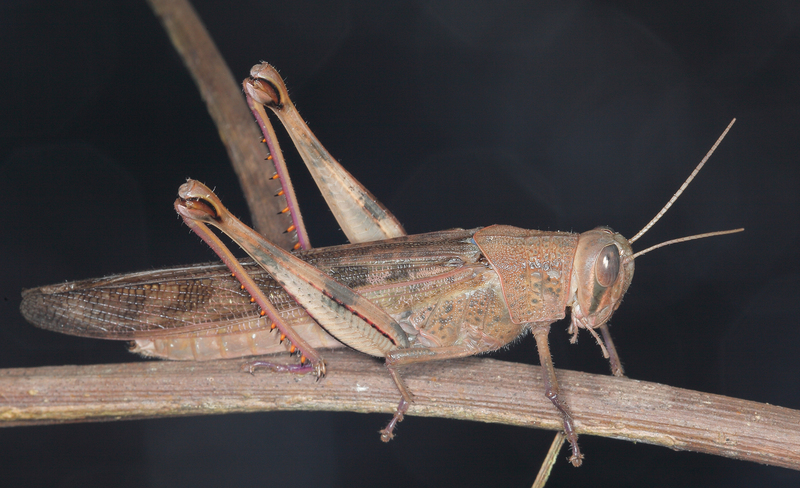 That's where they are placed in the Orthoptera Species File. 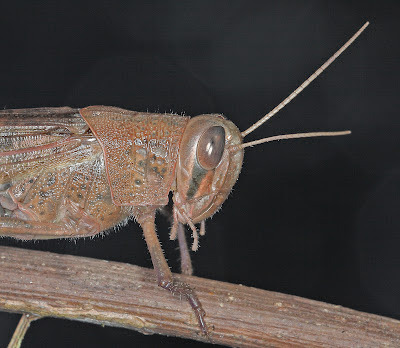 However, in the bible of Australian cricket taxonomy, they are considered a subfamily of the large cricket family, the Gryllidae. Australia has a great diversity of Mole Crickets. 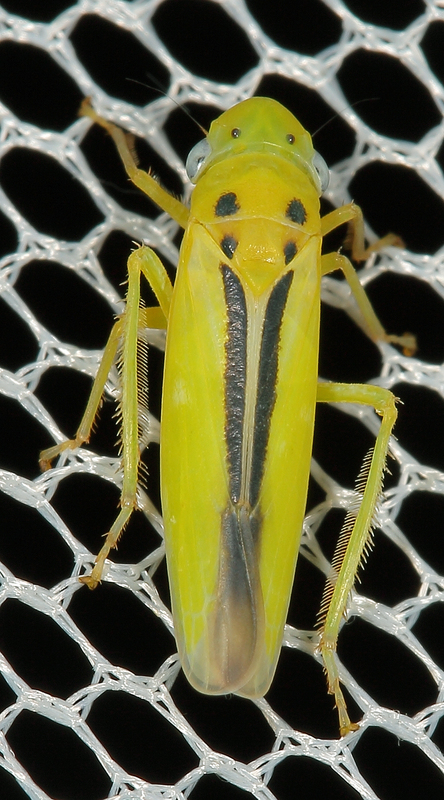 Most are in one genus, Gryllotalpa. Over 20 species are known. They are distributed across the continent even in the most arid areas where they are concentrated around sinks and watercourses. There are some species that defy the tradition that they are always associated with water. 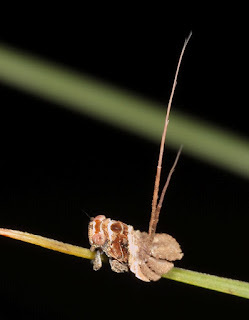 I found a new species at the top of Mt Franklin in the Australian Capital Territory where it was living in leaf litter amongst house-sized boulders. Mole Cricket species are tough to identify. The calling song of the male is the distinctive feature. Females of some species also produce sounds, probably in defense of their eggs in the chambers of their burrows. 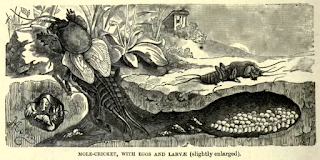 A stylised version of the mole cricket in its chamber. (From the web). Some species use the chamber as an amplifier and the singing male perches at the entrance and rotates his body 360 degrees as he produces his song. That is why it is often so difficult to locate a singing male. The sound seems to come from everywhere or nowhere! And most species sing only for a few minutes and that is at dusk when visibility is not good. They cease calling a the slightest disturbance. Calling can be initiated in late afternoons when lawns are watered. But this will only last for a few minutes. 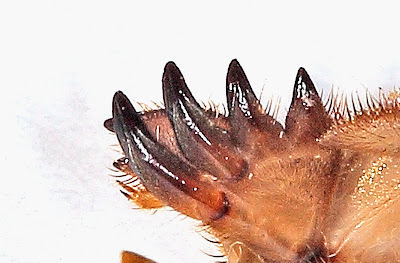 The Mole Cricket in the photograph is in the Monanka Species Group based on the combination of the large ocelli (false eyes), the presence of subapical spines on the hind legs. Beyond that it could either be G. monanka Otte and Alexander of G. coarctata Walker. Beyond that, identification is conjecture as the two species are often found together. Highly modified for digging, mole crickets are like little bull dozers as they tunnel thought the soil. The ocelli are the two white convergent ovoid structures just above the black eyes. The forelegs are highly modified with trowel-like spines that shift the dirt as the cricket moves through the soil. 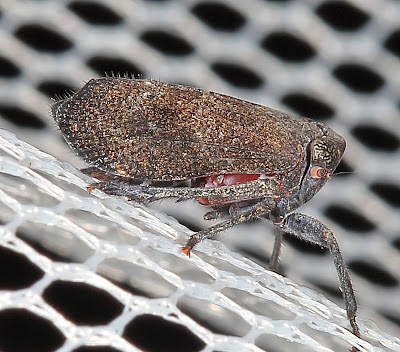 Most of the Australian species are in the genus Gryllotalpa but there is a potential problem with an introduced pest, the Changa, Scapteriscus didactylus (Latreille), a South American species that causes damage to a diversity of crops. It was introduced into the Newcastle, NSW region in the early 1980's apparently in ship's ballast which was used for golf courses in the Maitland and Wallsend area. Tunneling mole crickets do not meet with the approval of golfers! They make the surface of the ground uneven and their tunneling often breaks through causing hills and dales. 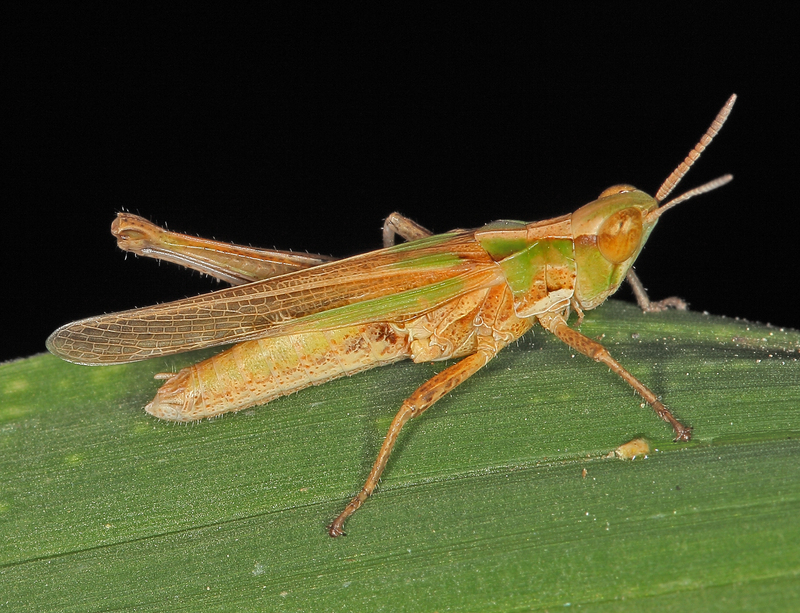 This cricket is very distinctive. 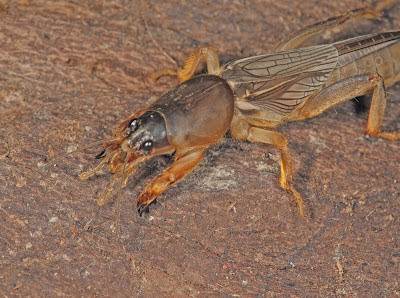 It is much larger than normal Australian mole crickets and has two instead of for "dactyls" (A fancy word for the finger-like claws on the foreleg). (See paper below for details). Mole cricket biology is in its infancy in Australia. Not much has been done in this respect since the work of Normal B. Tindale in 1928. And this brings us to the larger than life figure of Tindale. He was born in 1900 in Perth. He was influenced into science by his father but during an experiment in his father's photographic lab, Tindale was involved in an explosion and permanently lost the sight of one eye. This did not discourage him. He decided to continue with science and his inspiration was Alfred R. Wallace. Tindale is claimed by entomologists and anthropologists alike. An inspirational read is his obituary by Philip G. Jones. Tindale's entomological accomplishments are many. He was associated mostly with the South Australian Museum and there is a hall there named in his honour. 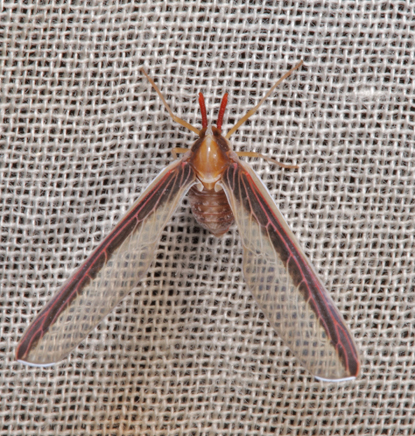 Aside from detailed work on the taxonomy and biology of Australian Mole Crickets, Tindale was the world's expert on Ghost moths, the Hepialidae. Not only did he work out the taxonomy of these moths but he studied the intricate habitats of their peculiar larval biology and the odd behaviour of the adults. He was also an ornithologist, geologist and a linguist. During World War II he spent time at the Pentagon decoding and translating Japanese transmissions intercepted by the Allies. He was unable to enroll in the active military because of the loss of sight in his one eye. But some of Tindale's most notable accomplishments were in the field of Anthroplogy. This began in 1921 with a trip to Groote Eylant where he initiated studies of the aboriginal community. He was associated with Sir Walker Baldwin Spencer who encouraged him to take detailed notes every day. Thus began a wonderful career as noted below in the notes from Jones' obituary. "Looking back on Tindale's career it is possible to discern half a dozen research paths which he followed, converging and diverging but persisting across several decades until his death. Few specialists would attempt to emulate such a course today; in Tindale's time, as his colleague and friend Joseph Birdsell put it later, it represented the 'proper breadth of interest'. In entomology, his first love, Tindale selected the study of the Hepialidae, one of the most primitive of the moth families; in geology his particular interest became the study of Pleistocene shore-lines and Tindale was to become recognised as one of the 'foremost workers on the Pleistocene geology of Australia' (Daily 1966). In linguistics as in broader anthropological studies his object was to gather sufficient data to scientifically describe variation in Aboriginal culture and society across the country. The same applied to his physical anthropological surveys. More focused studies, such as an investigation of initiation practice, Western Desert art and mythology, or the detailed description of a coastal and riverine society, followed from this survey data. In archaeology, informed by his geological and ecological training, Tindale's object was to establish the broad canvas on which more specific applied or theoretical investigations could be painted. Tindale's field trips became the testing ground for this tumult of ideas and theories against a background of wide reading in each area and constant rapport with colleagues, nationally and internationally." I met Tindale personally in the 1960's when he visited the California Academy of Sciences. He was living at Palo Alto, just south of San Francisco where the Academy is located. I had no idea at that time that I would ever even visit Australia, let alone establish a career there. Tindale was a personable and encouraging person. I always recall this meeting and was I was privileged to dedicate a widespread southern, Shield-backed Katydid species, Oligodectoides tindalei Rentz, in his honour. Remember he did all this research with only one eye! Rentz, DCF 1995. 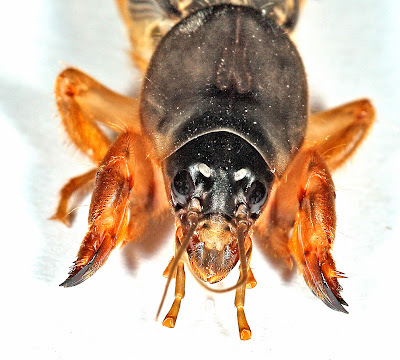 The Changa Mole Cricket, Scapteriscus didactylus (Latreille), a New World pest established in Australia. 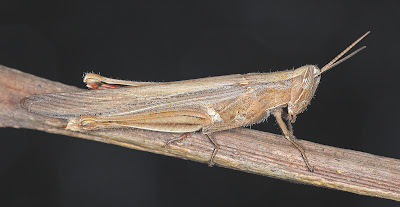 (Orthoptera Gryllotalpidae). Journal of the Australian Entomological Society 34: 303-306. It is not everyone's cup of tea to be wondering in the dark of a winter's night in the forests of Davies Creek in Dinden National Park. But it can pay dividends. 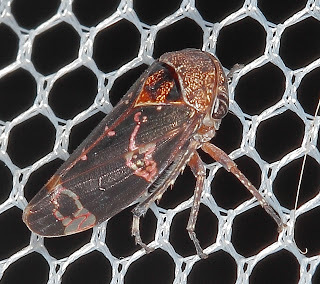 Such a foray on a windy, cool night resulted in the discovery of a nymph of the Balsam Beast, Anthophiloptera dryas Rentz and Clyne. 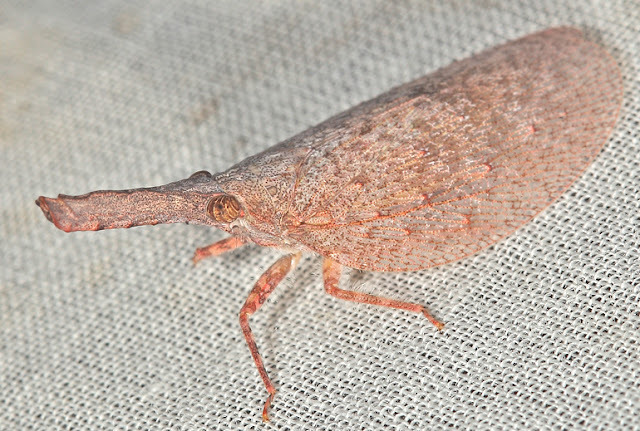 I have written of this before and the other member, Zaprochilus mongabarra Rentz, of this endemic subfamily of katydids (Tettigoniidae) that occur in the northern tropics. 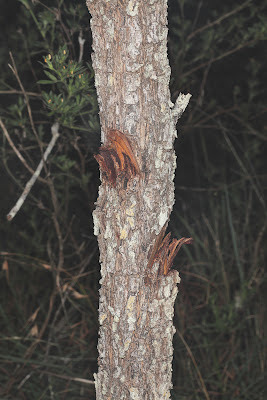 This discovery of A. dryas in a stand of mixed eucalypts, acacia and Casuarina on a winter's night was welcome. But it is not too surprising because all of the Zaprochilinae are winter and spring-occurring katydids. All feed on flowers, pollen and nectar. This nymph was having a go at the pollen on the many grasses that grow as the understorey of the forest. It has a few moults to go before it is an adult. But it had better hurry so that it can fly and escape the peril of the "control burn" which is inevitable in this National Park. Incidentally, this is the westernmost known locality record for this species. It is not known from the forests on the Atherton Tableland but should be sought there. The prognathous mouthparts are a characteristic of this subfamily. 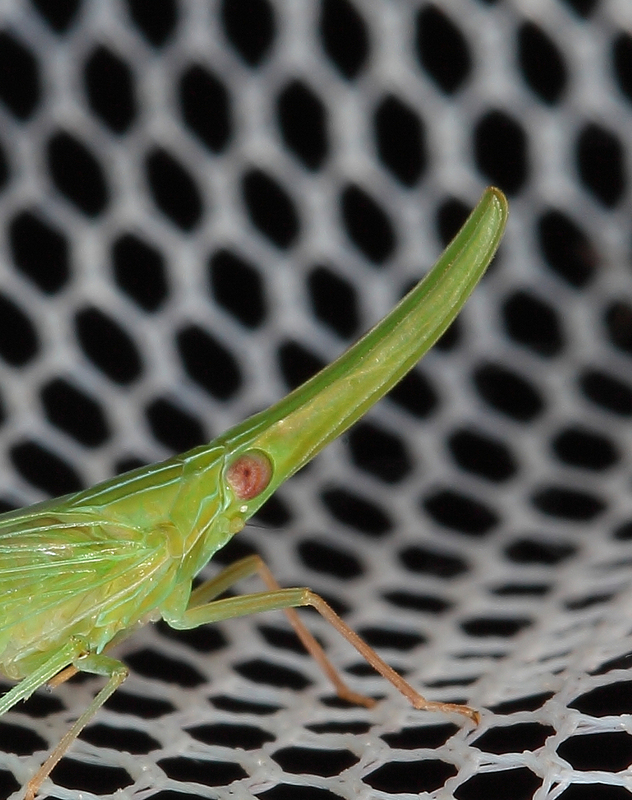 This supposedly enables the katydid to penetrate deep into a flower and retrieve nectar. 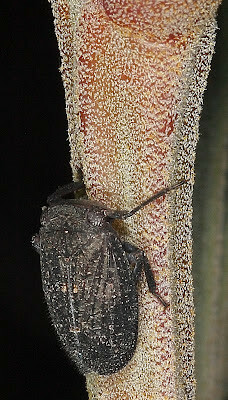 Note the small sword-like structure emerging from the tip of the abdomen. 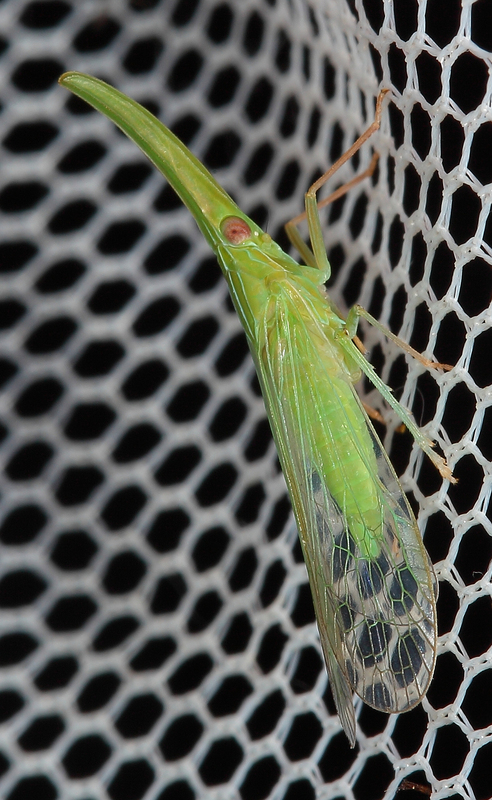 This is the developing ovipositor and that tells us the katydid has a couple of moults to go before it is an adult. This should happen in late August. There is a mixed open forest habitat we visit regularly for moth and orthopteroid photography. It is unfenced and on ground that would not seem to support anything else. it is sandy soil that is always wet. There is an abundance of grass cover, mixed wiry native grasses and a number of introduced ones. There is a pungent herb that grows to about 1.2 m and, of course, scattered Lantana. 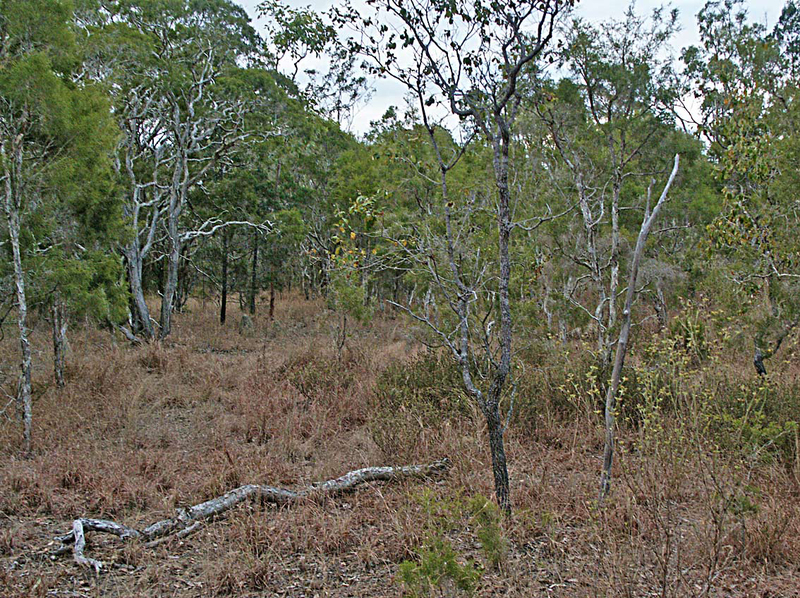 The locality, north of Mareeba. Dominant trees are Callitris, Melaleuca with a few scattered Eucalyptus. You can imagine our surprise and dismay to find virtually every tree "ring-barked". This is a technique used in the Australian bush to kill trees cheaply and thoroughly. One can understand the importance of clearing the bush but it is sad when one sees it as graphically as it is here. 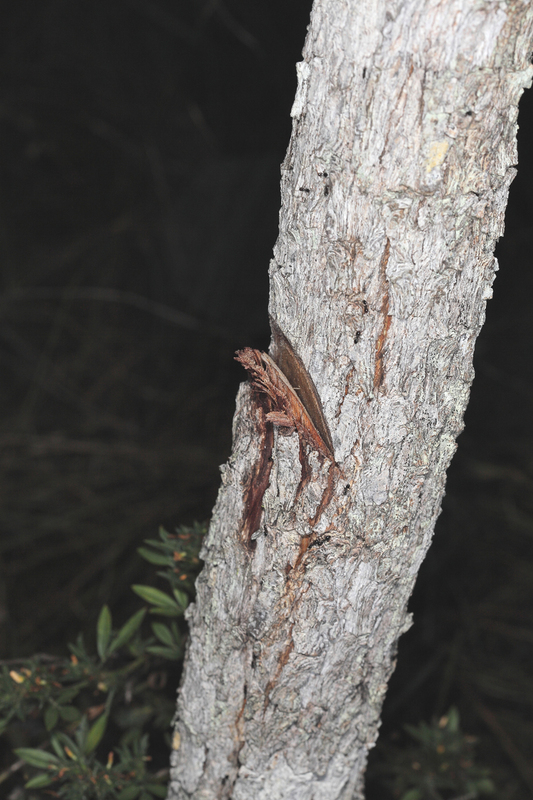 If you look to the bottom of this photo, you will see a female cricket laying its eggs in the loose bark. More on this in a later blog. A single cut is all that is needed in smaller trees to disable and eventually kill them. Two cuts assure eventual death. 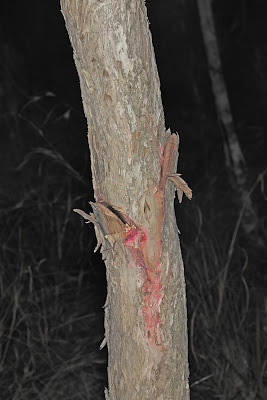 We noted that larger trees were cut and given a dose of a poison of some sort. All of the Paperbarks are festooned with little orchids, Dendrobium canaliculatum. These plants will flower in the next several months for the last time. 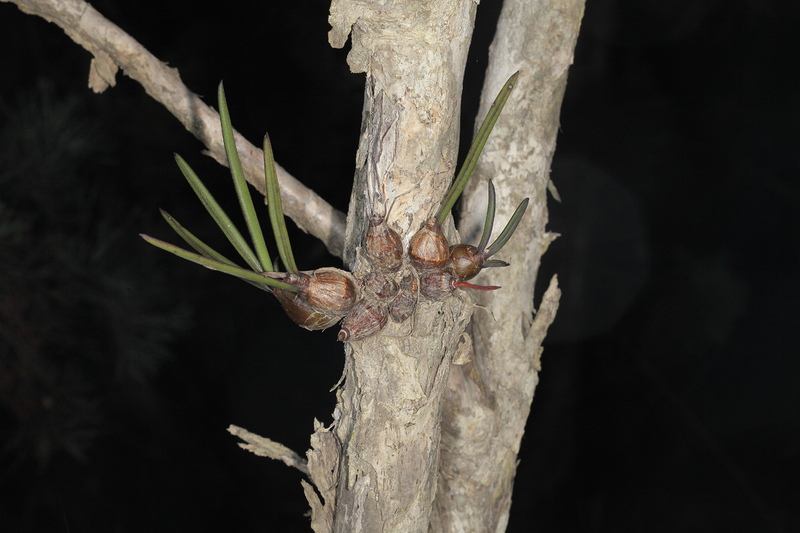 Once their host tree dies, they are doomed as it will topple over ending the life of the orchid. In this small patch there are hundreds and hundreds of these plants, some growing on their hosts within a few centimetres of the ground. A very disappointing development. 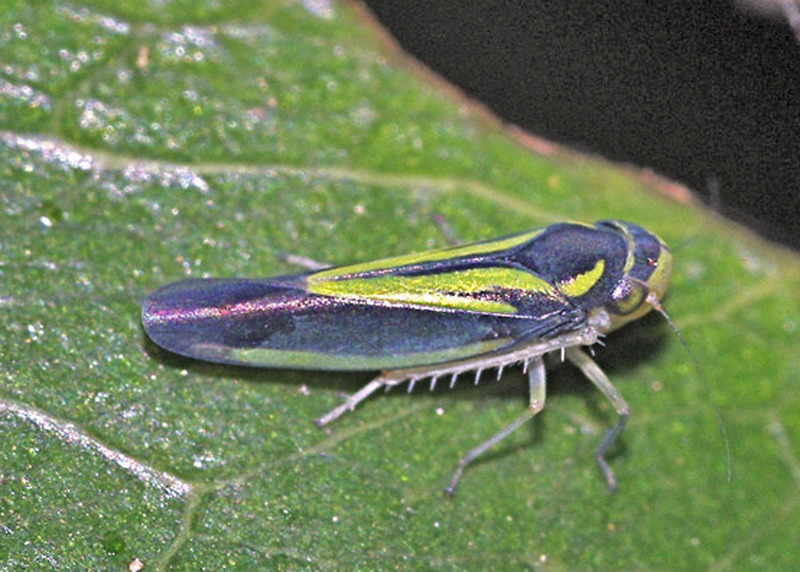 Most gardeners think of leafhoppers and planthoppers as insects to be kept out of their gardens. Australia is blessed with an abundance of species in many families. When viewed up close their intricacy in shape and colour can be appreciated. 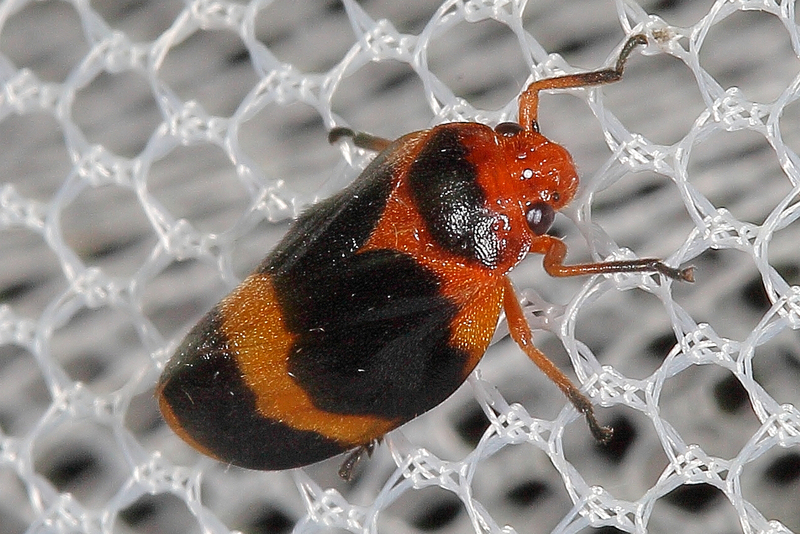 The great majority of species have no interest in garden plants and are tied to certain hosts. 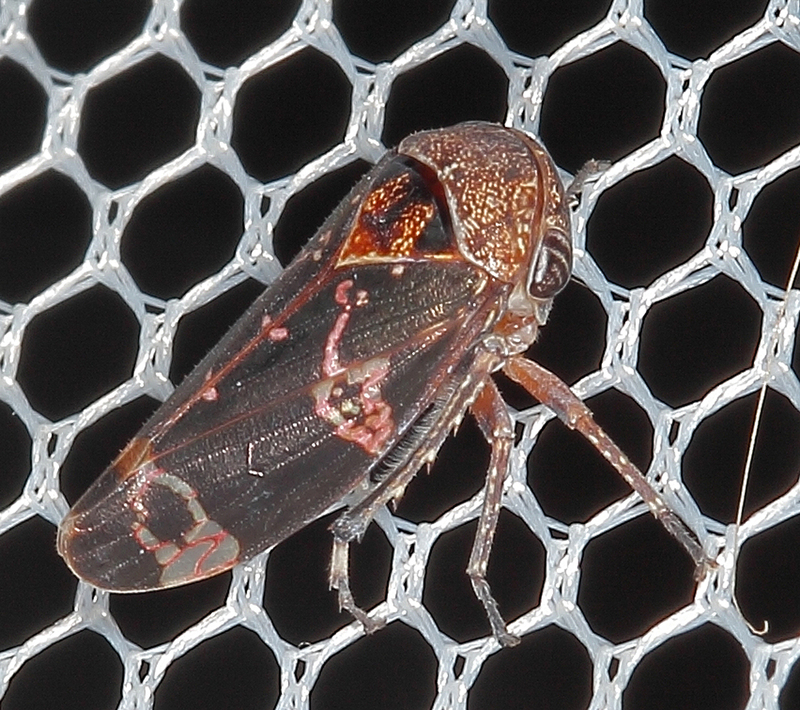 Many have associations with other insects. As with many Australian insects, large numbers of species remain to be described and documented. Several have been dealt with in this blog from time to time but an array of species makes the point stressed above. I am grateful to Dr Murray Fletcher for his help in identifications. Further information and identification can be made from the AustralianPlanthopper website. Cicadellidae: Deltocephalinae Unknown genus. Group needs work! Olonia sp. Eurybrachidae: Platybrachinae; Platybrachini being tended by ants. 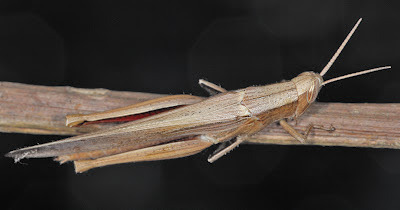 Sugary exudates of the hopper are fed upon by these Camponotus sp. ants. This fellow was photographed about 1 km from the Cairns CBD but on the other side of the inlet. One must take care when wandering along seashores and especially along creek and river margins in the tropics of Australia. It is the Dry Season (tropical winter) and things are a bit slow but there is still some activity. Here are a few rather recent items that may be interest. 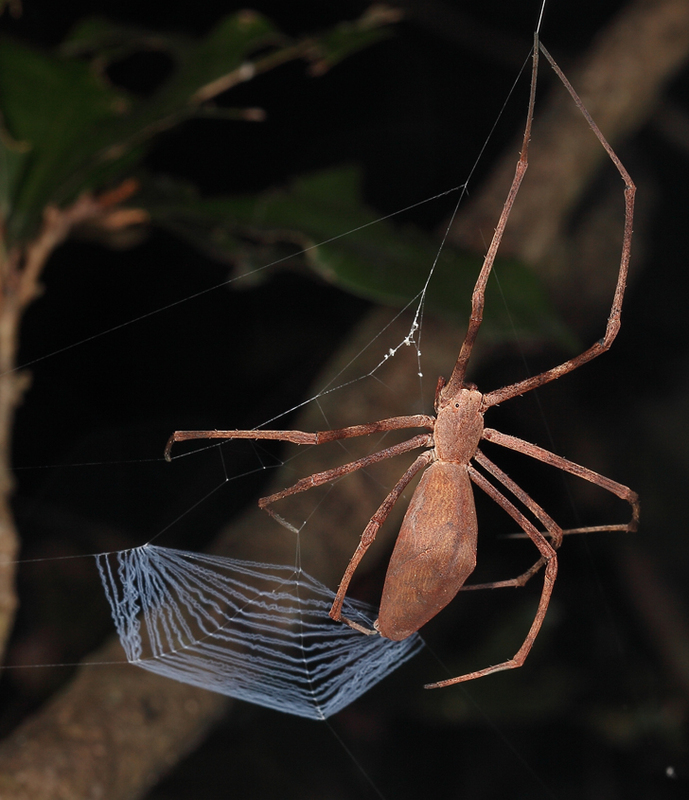 The Cast-net spider Deinopsis, family Deinopidae, Deinopsis sp., is a favourite. This spider constructs a net that it throws over an unsuspecting victim. Oncopera sp is usually a harbinger of cold weather. 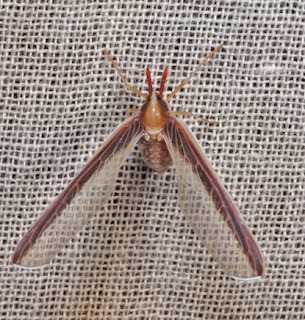 It is a hepialid-not one of the most attractive of the family but a nice moth to have around. 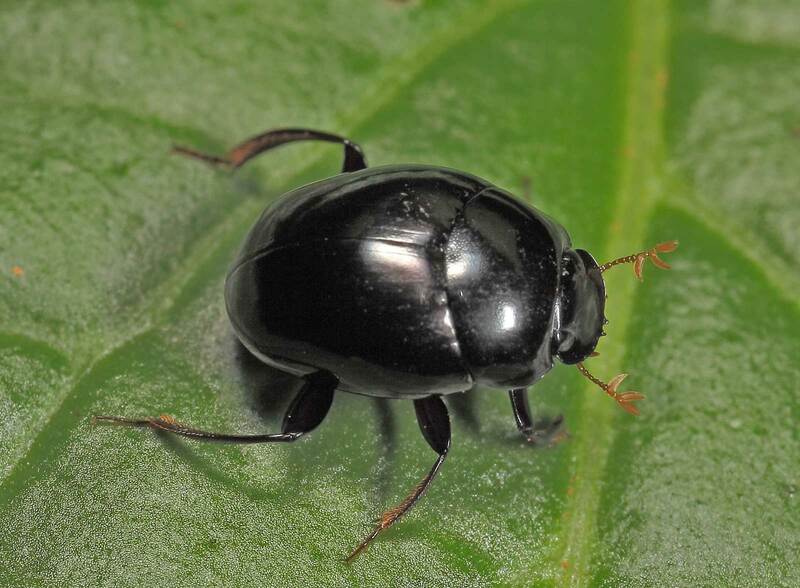 One of the native Australian Dung beetles, Temnoplectron politulum. 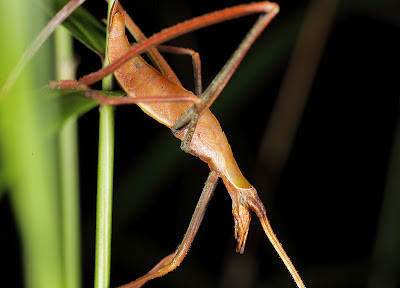 This is one of several species encountered in rainforests after dark. They perch on leaf surfaces awaiting the the "call" of fresh dung from native nocturnal mammals. The Calephorops, Calephorops viridis Sjostedt, Acrididae: Acridinae; Acridini is at home in short grass or along the margins of disturbed habitats. It is often found along the shore of marine situations where it seems to be associated with stiff grasses like saltgrass, Distichilis. 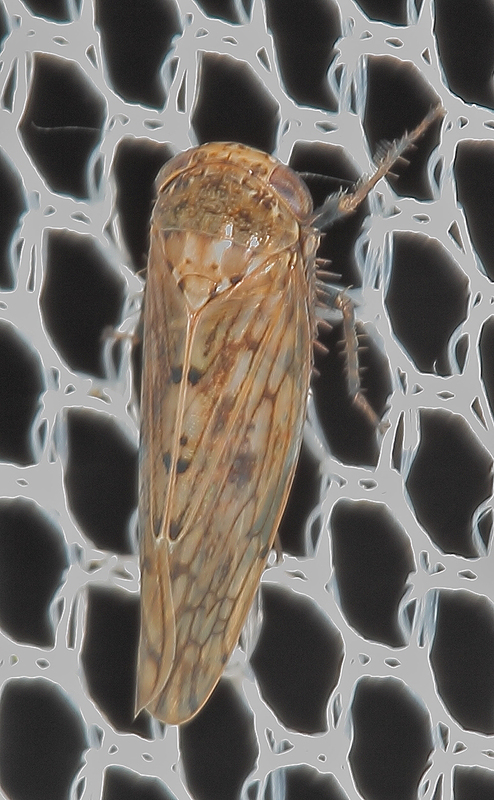 It can often be found living on the margins of athletic fields. It is a noisy grasshopper and produces a buzzing flight that lasts for less than half a second. 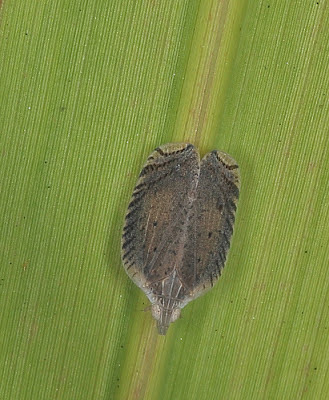 It is much smaller than the related Froggattina australis (Walker), males averaging about 15 mm in length. Here it is perching on a grass blade. The Spotted Spur-throated Locust, Austracris basalis (Walker), Acrididae: Catantopinae; Cyrtacanthacridinae is one of several grasshoppers that overwinter in the adult stage in the tropics. Others can overwinter as eggs or as developing nymphs. Adults like this one are usually in "reproductive diapause", that means they do not mate nor do they lay eggs at this time. The pots on the tegmina (forewings) are often distinctive of this species. 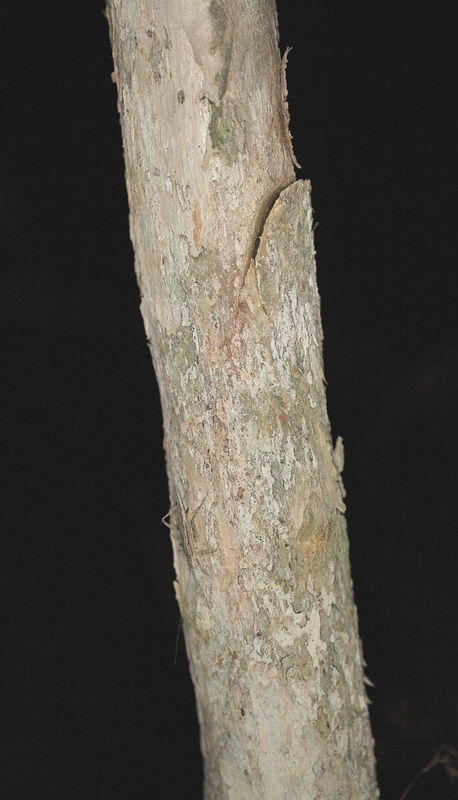 The genus Austracris contains more than six species within Australia and in the Indo-Malayan and Pacific region and is in need of revision. 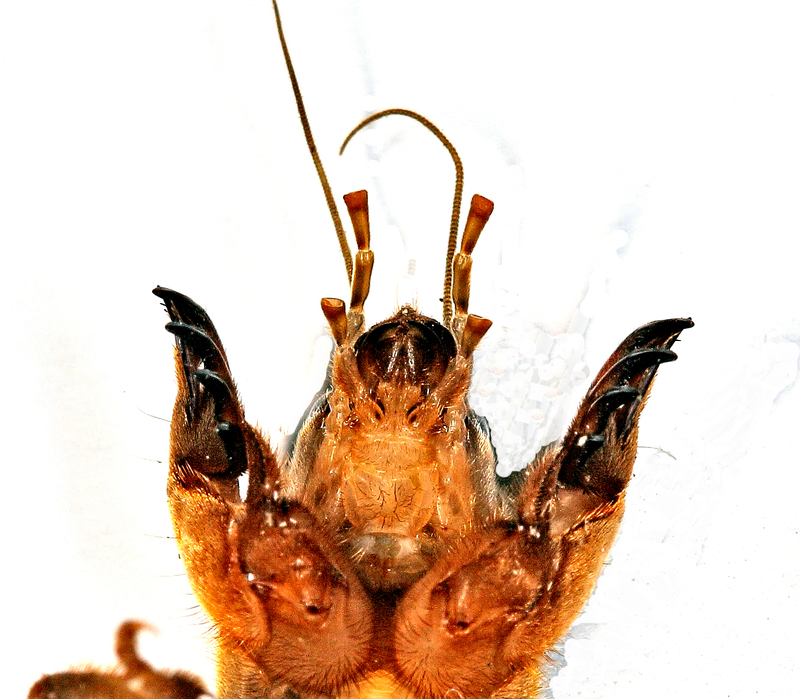 Head and thorax (pronotum) of the specimen above. 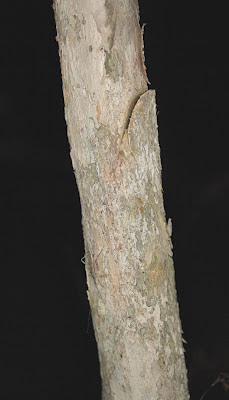 The stripe below the eye seems distinctive of the genus. The Light-brown Sharptail, Stenocatantops vitripennis (Sjostedt), Acrididae: Catantopinae; Catantopini; Catantopina (quite a name!) is another species that overwinters and as adult. It will produce several generations over the course of the year. It is common in the tropics from coast to coast where it lives in dry grass. It is quick to take flight when disturbed.